Some may be aware that I’ve long owned the seperate titan princeps and moderatii box, as well as the Titan Tech Priest. 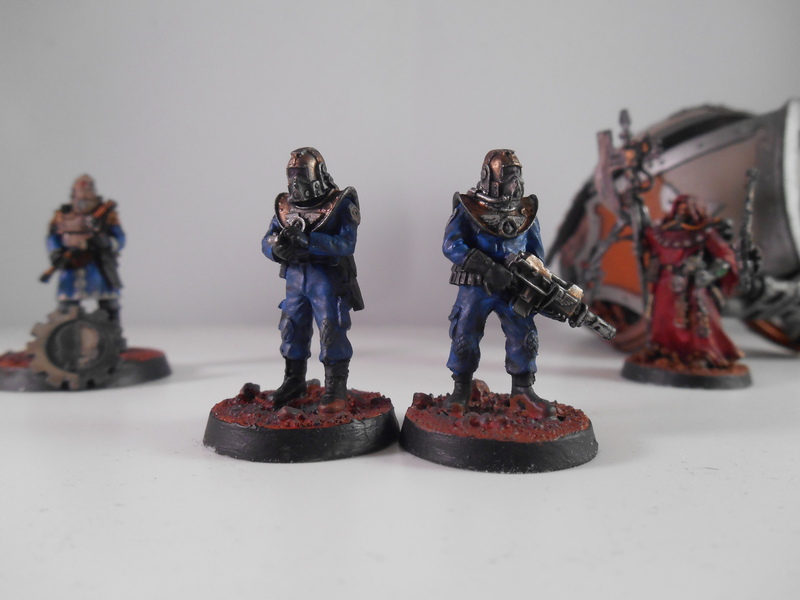 they’re technically intended for the Reaver, but since moderatii are identical in both..I figured I’d paint them appropriately for the Warlord. 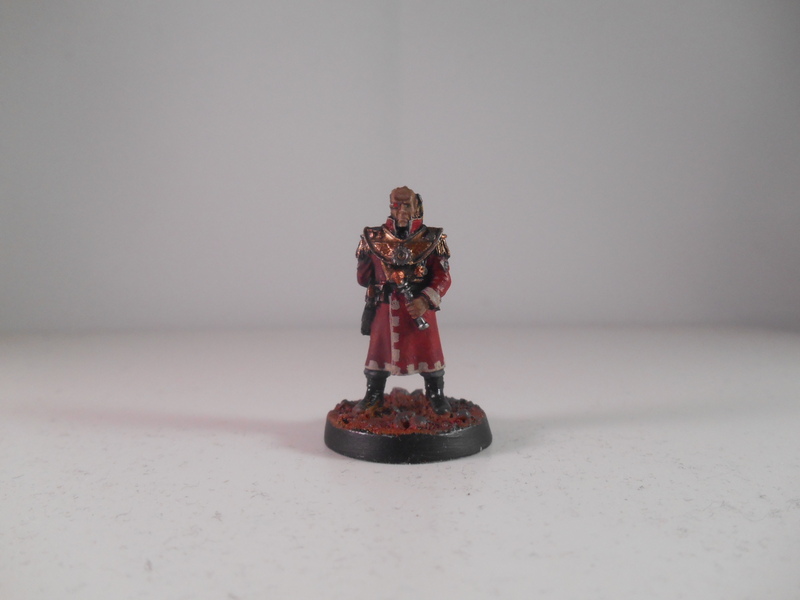 The Warlord’s head comes with an extra Princeps-Alpha for tabletop use, so I figured I’d make a Thing out of painting the entire crew. 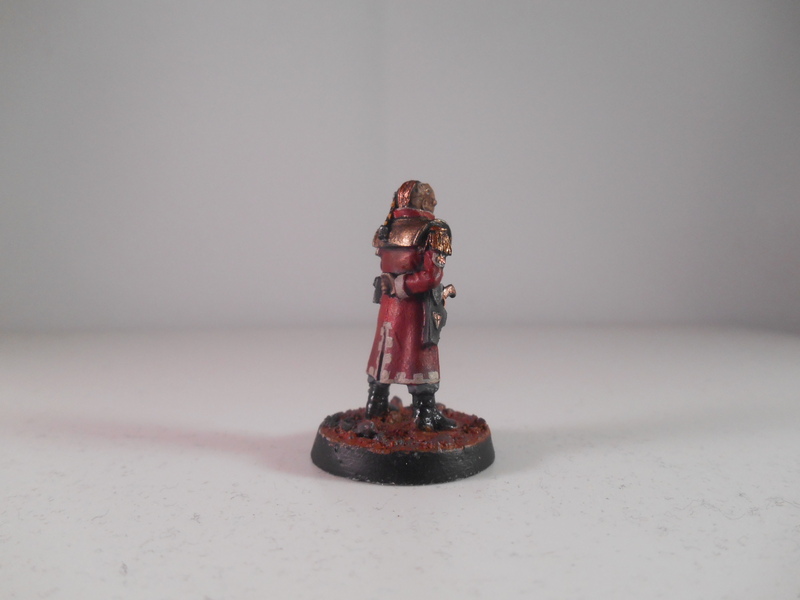 For the Princeps, I’ve added a Cognis-Signum badge to his base, GW went through a bout of providing them for free in every mail order when the Admech and skitarii came out, so I naturally have quite a few! I’m still waiting on word about my new flat, so I’m unwilling to buy the rest of the titan until that’s all sorted in (hopefully) a few weeks. Plenty of time to handle my other projects! 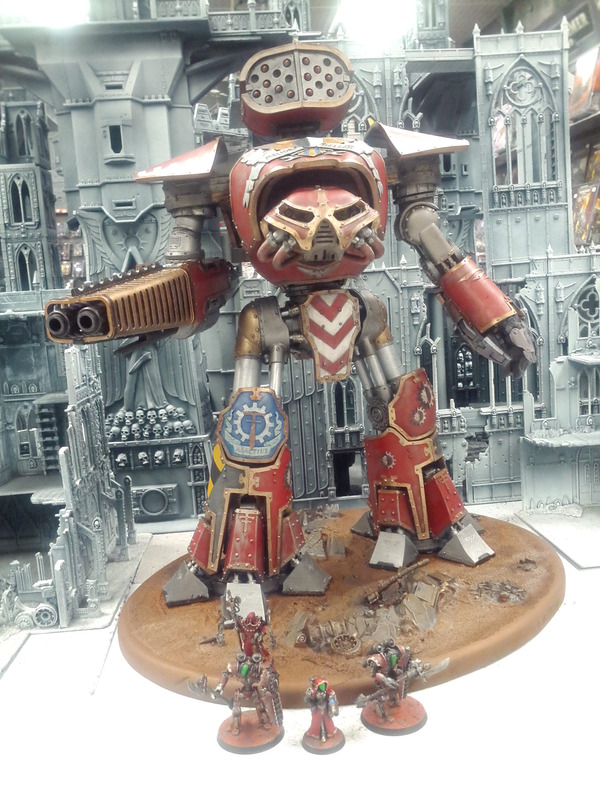 This entry was posted in Mechanicum, Skitarii, Titan, Warhammer, Warlord and tagged 30k, 40k, Admech, Big-Spenda, Forgeworld, Heresy, Horus Heresy, Imperium, Moderati, Moderatii, Princeps, Tech-Priest, Titan, Warhammer, Warlord, Warlord Titan on July 29, 2015 by ruadhan2300. 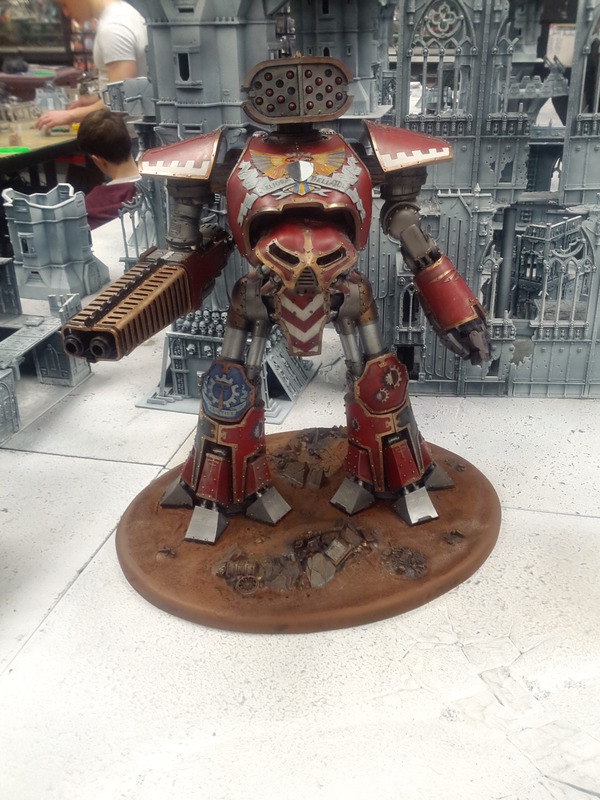 For those not aware, as soon as I saw the release announcement of the Warlord Titan some months ago I made the declaration on the spot, I must have it. Did some figuring, worked out that I could afford it and had the space/tools/willpower to complete it. Some complication is to be had by the fact that I will be moving house over the next month or so, so rather than have the box sitting under my desk taunting me for the whole move, I decided to invest in just the Head of the titan to start. It should take me a week or so to get it done, from there I should be well settled into the routine of moving house. My package arrived in the mail this morning! 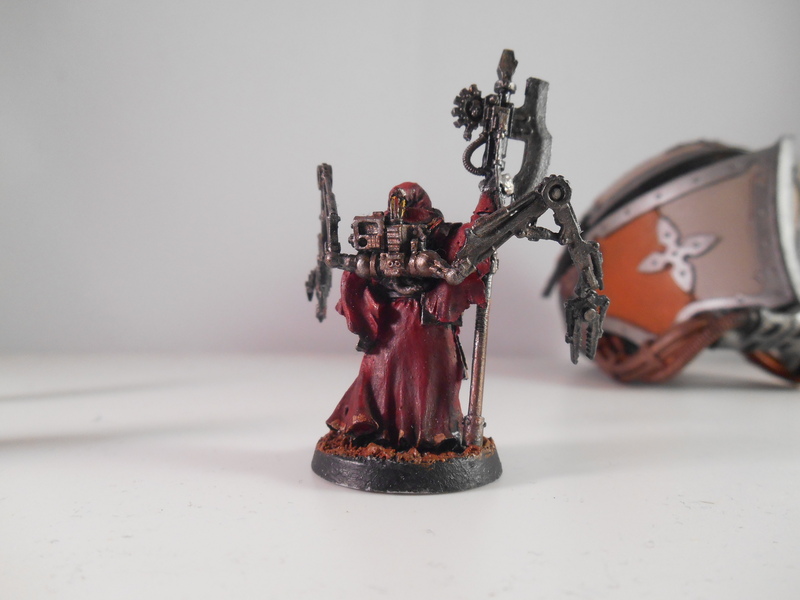 I was kind of lucky to live in a house-share because I was fast asleep at the ridiculous hour of the morning they delivered it..
Then I went out to Games Workshop and set to work. 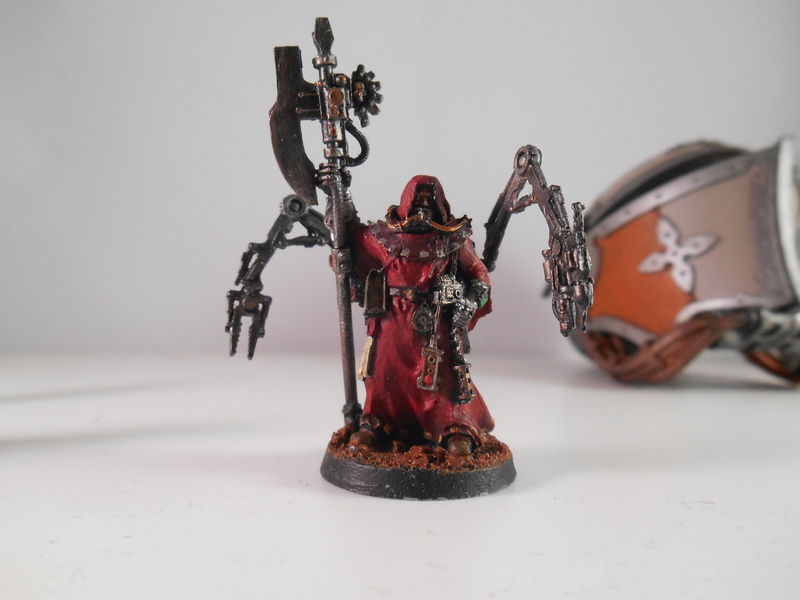 While everyone else celebrated the official release of Age of Sigmar, I painted and painted and painted.. 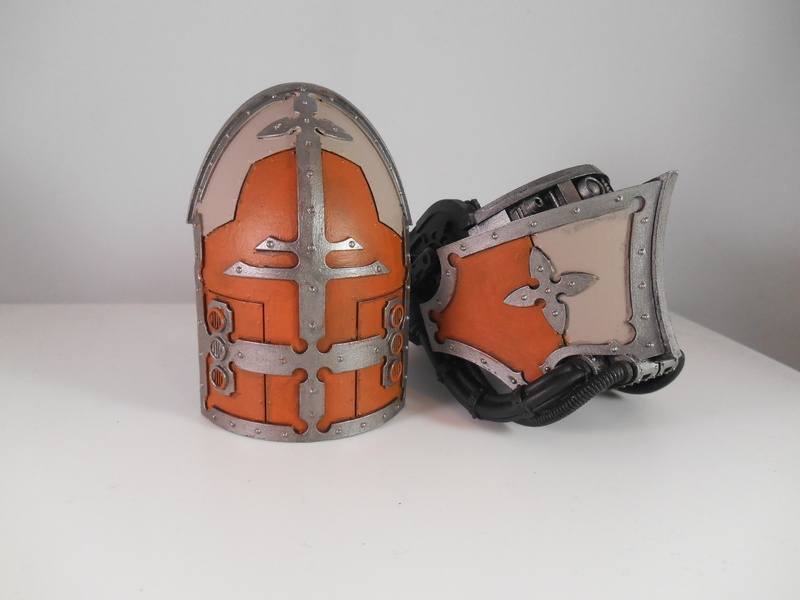 The plan broadly is that the head will be orange and white as shown, and most of the armour plates will be blue. 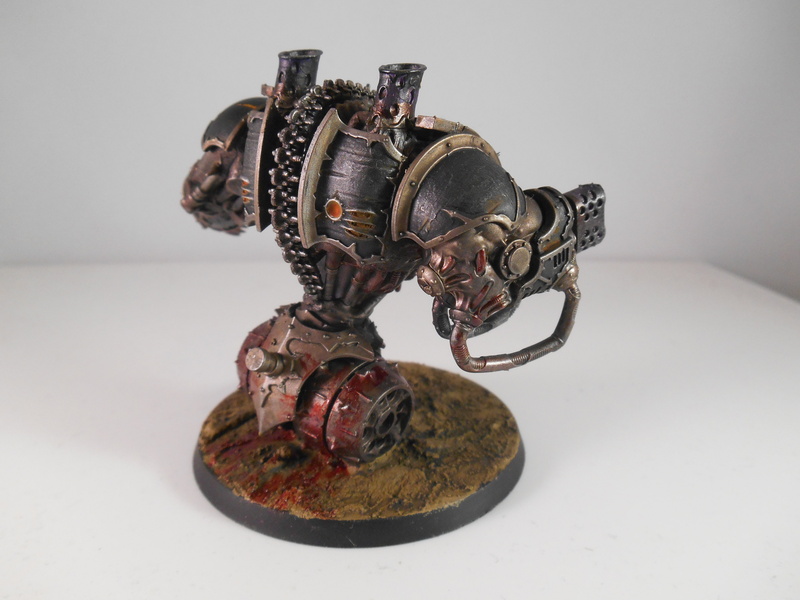 At least a couple plates will be done in red and dedicated to the Mechanicum with cogs and cognis-mechanicum logos. 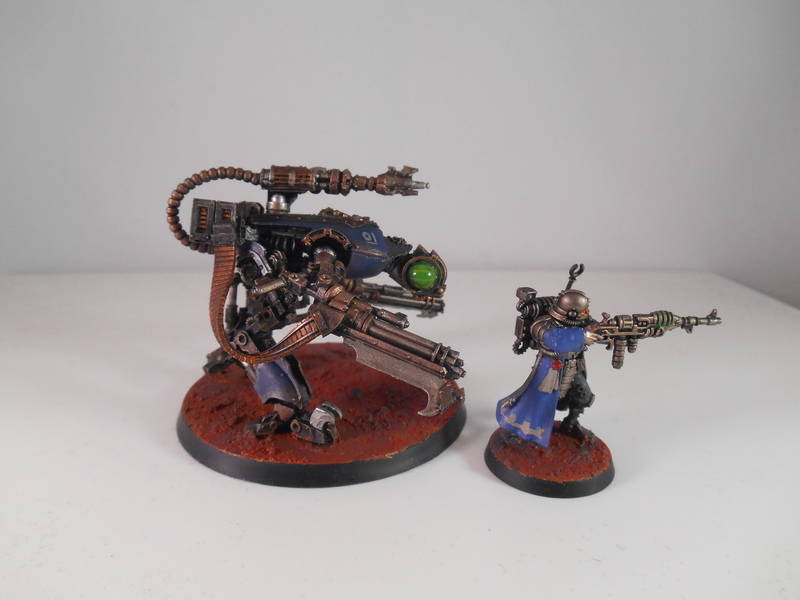 Armaments’wise I plan to have a volcano cannon, two apocalypse missile launchers and a Saturnine Lascutter to start, I may invest in other weapons depending on performance in battles. For now though, just the head. On with the new adventures! 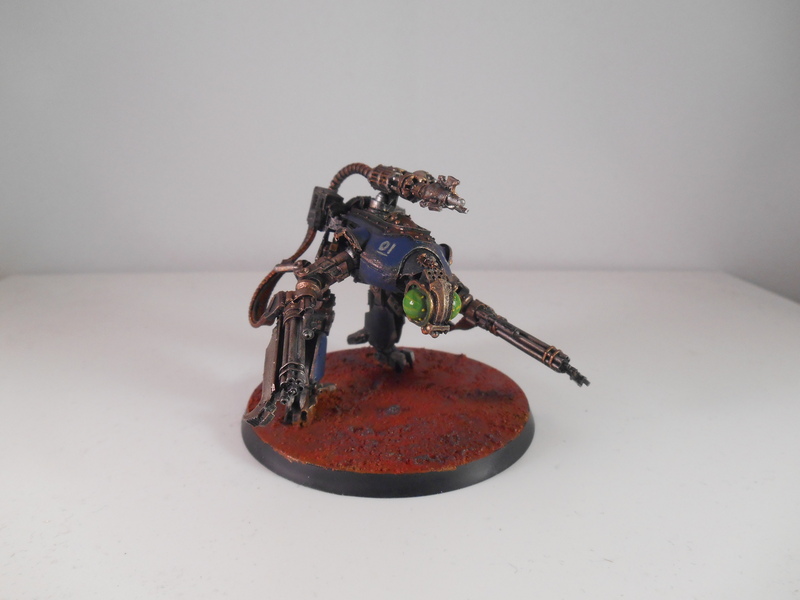 This entry was posted in Mechanicum, Titan, Warhammer, Warlord and tagged 30k, 40k, Admech, Big-Spenda, Complete, Forgeworld, Heresy, Horus Heresy, Mechanicum, Titan, Warlord, Warlord Titan on July 11, 2015 by ruadhan2300. It’s been a pretty eventful week or two! 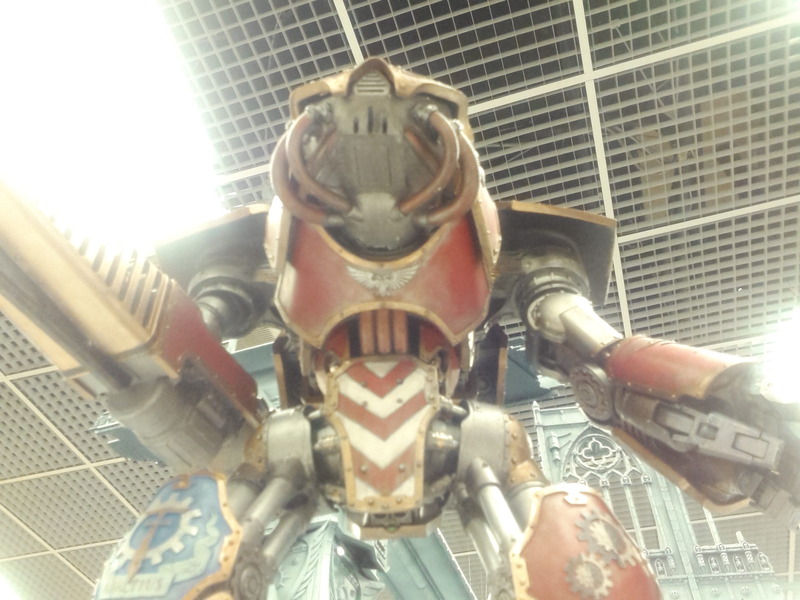 I and a friend travelled down to Nottingham to see Warhammer World for the first time. I’m totally blown away by the experience, it was utterly fantastic. Brought back a bunch of “souvenirs” too. 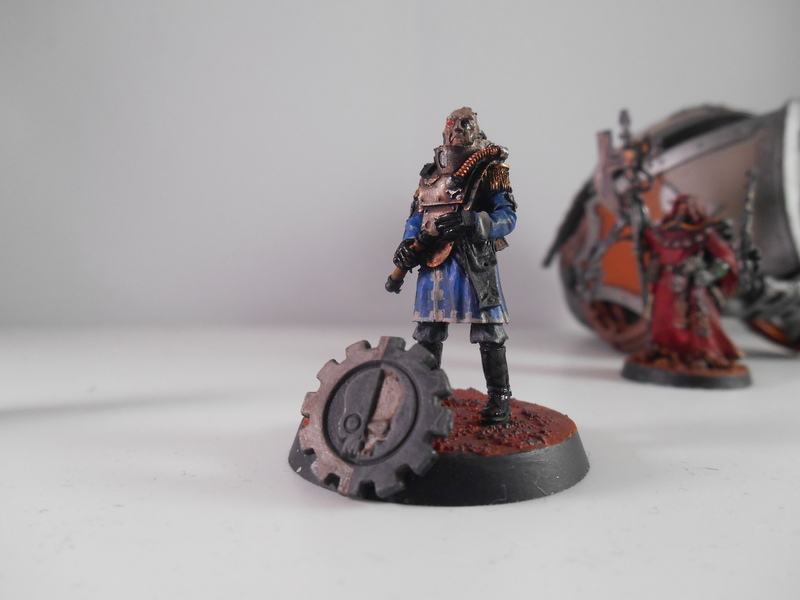 And a pack of a Solar Auxilia Veletaris Storm Section. 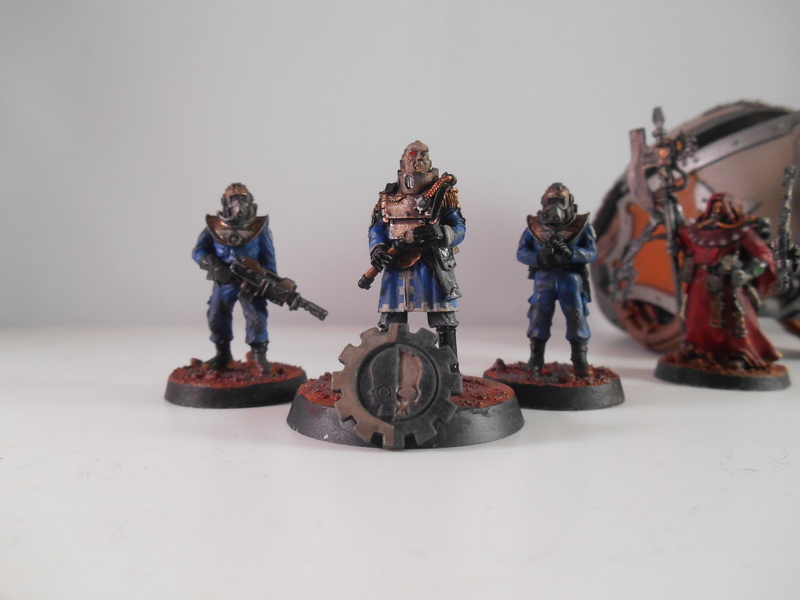 I love the look of them and decided I really wanted a squad of them! 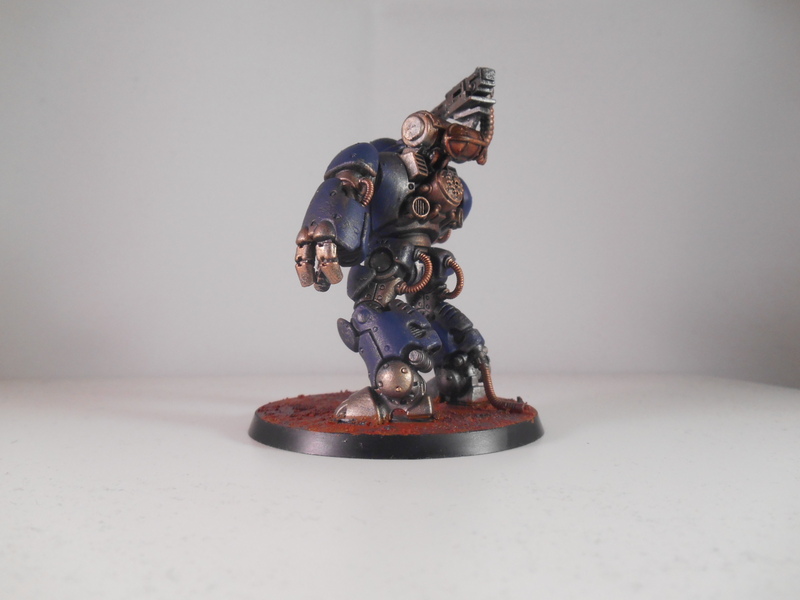 They’ll have to wait though, because I’m working my way through a pack of Vorax Battle Automata and Kataphron Destroyers. I have one of each done! 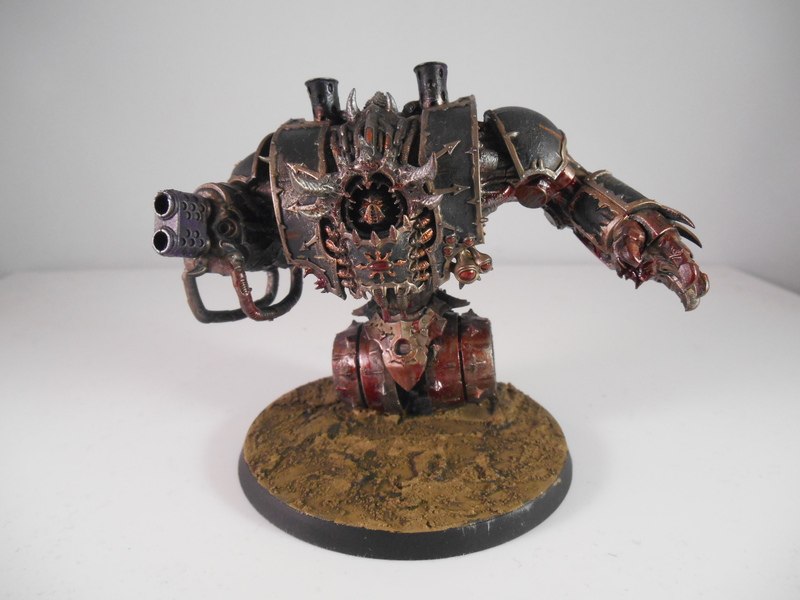 I was also able to get around to painting my Hellbrute conversion shown in my last post. Ah well. it should all work out. 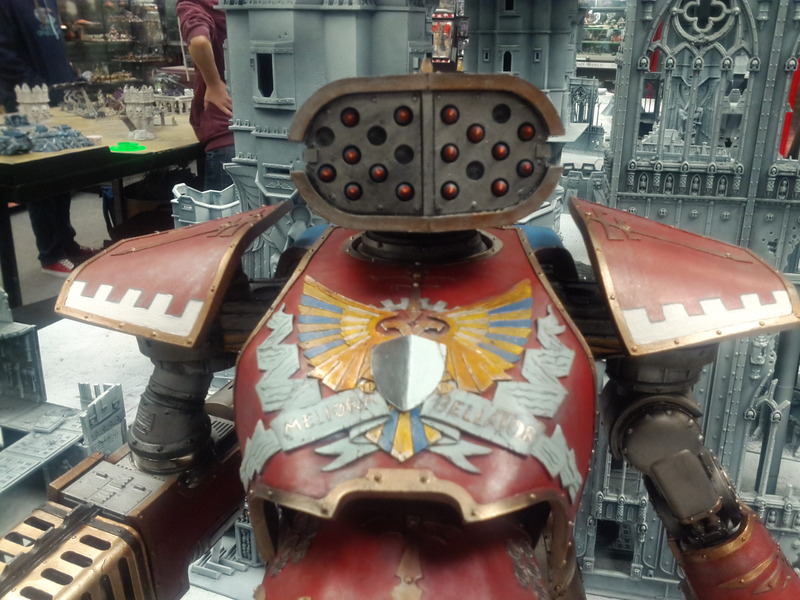 This entry was posted in Conversions, Mechanicum, Skitarii, Titan, Warhammer and tagged 40k, Admech, Automata, Big-Spenda, Complete, Conversion, Daemon, Dark Mechanicum, Forgeworld, Heresy, Horus Heresy, Kataphron, Mechanicum, Photospam, Skitarii, Titan, Uninaut, Vorax, Warhammer on July 3, 2015 by ruadhan2300. 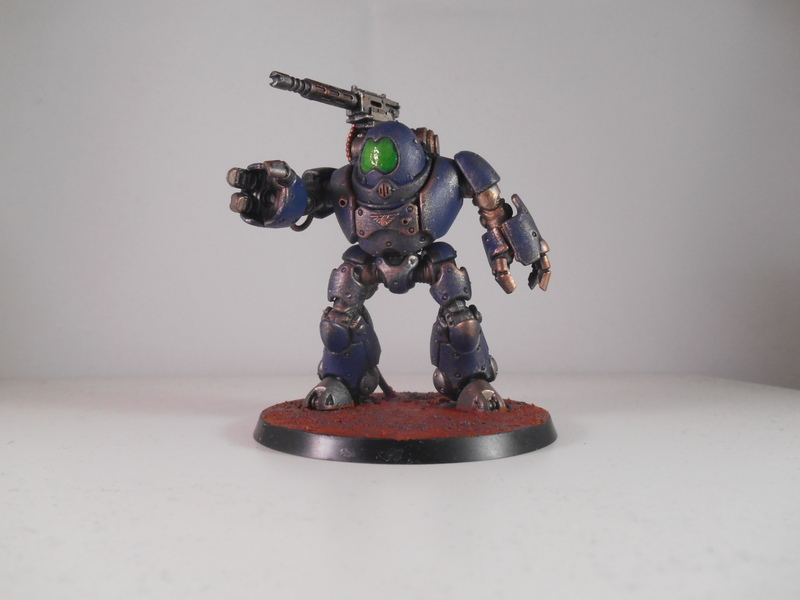 I finished the paintjob on my first Kastelan today. 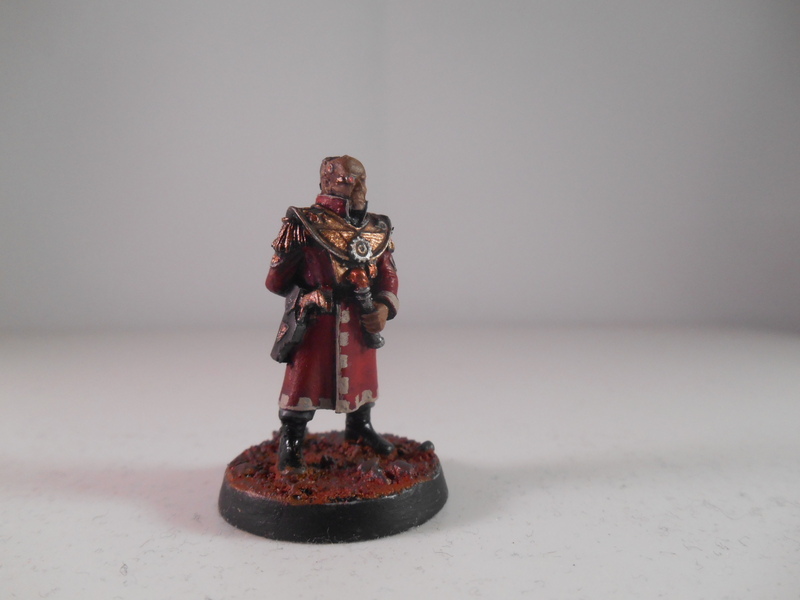 It still needs markings and insignia but the actual paintscheme is done. 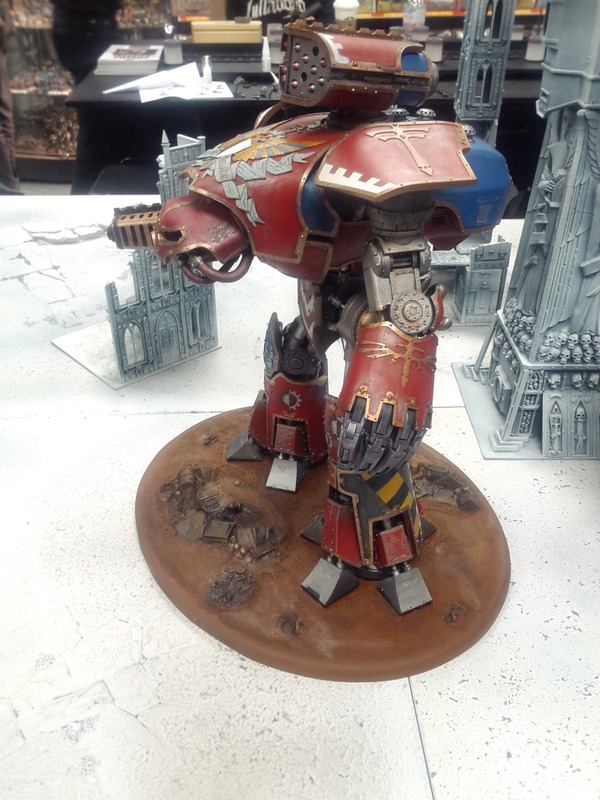 After a lot of hopping up and down in joy over the Warlord’s debut at Warhammer World this weekend (they had FOUR of them in the displays!) I’ve made the dubiously sane decision to buy one. The price-point is estimated at £1200. 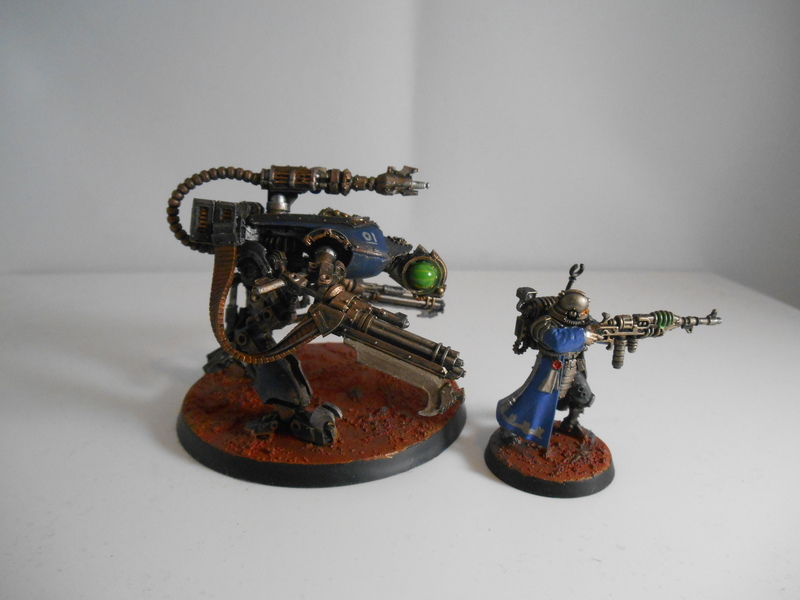 easily twice as much as the Reaver. 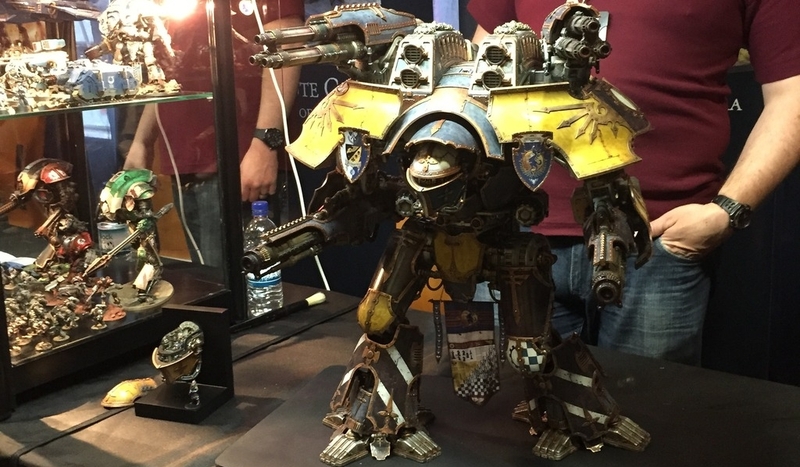 I’m hoping that includes the weapon systems, because Reaver weapons run at about £50 each and spending another £200 on top of the base cost would be pushing it. 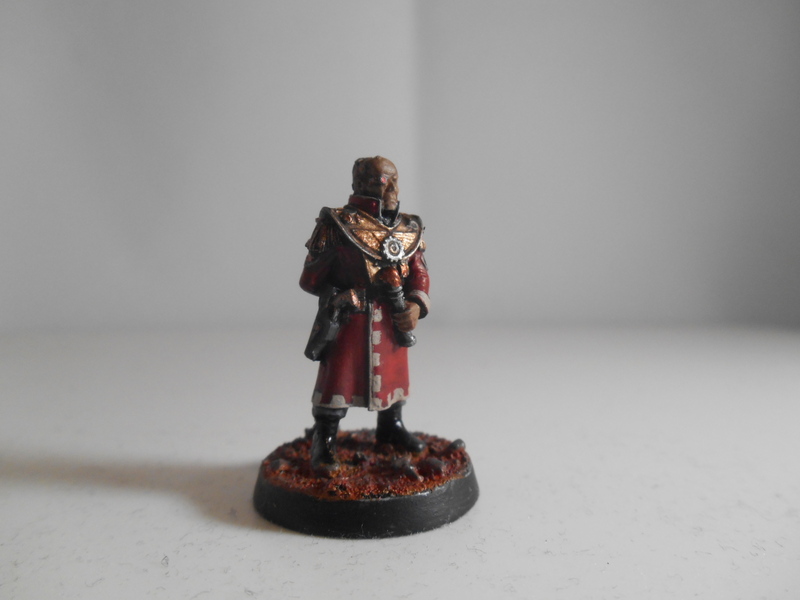 I estimate that constructing and painting the Warlord will take me about five months. maybe less if I’m really on the ball. I’m going to be taking everything I’ve learned building Meliora Bellator and applying it to this project. We’re talking heavy use of pinning and bolts. countersinking magnets into the shoulders. stuff like that. 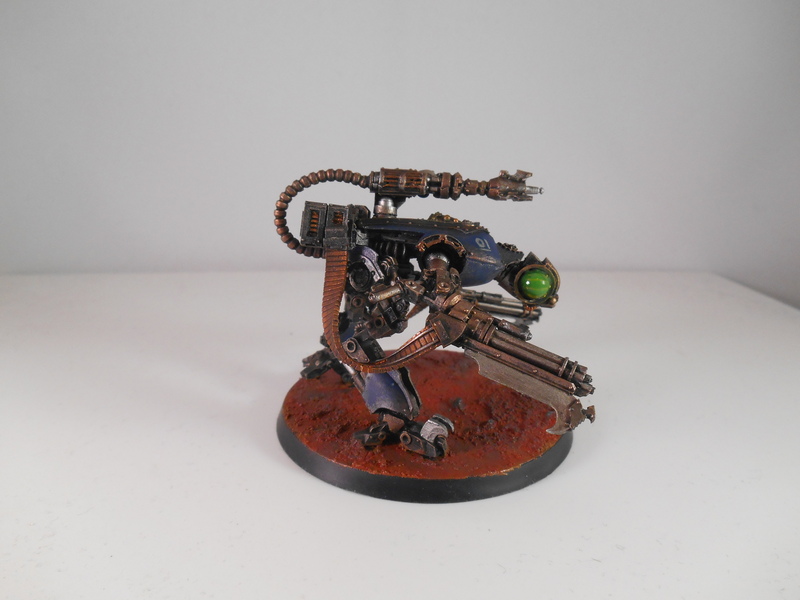 My reaver is adaptable, I can swap out any of the weapons, however the power fist is a chore to deal with, requiring power tools to remove it safely. At any rate, spreading the £1200 price-tag over five months averages out at £8 a day. I think I get good value for money! 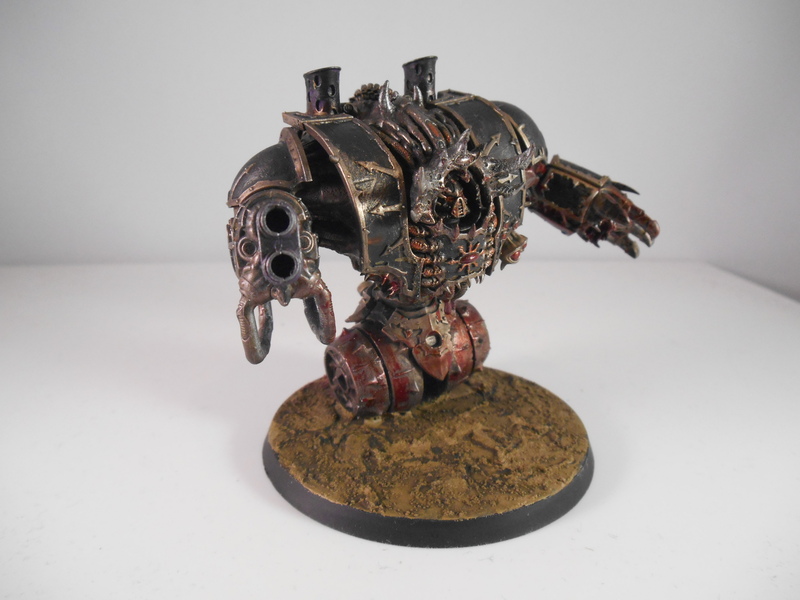 And the biggest and baddest war machine anyone can bring to bear in Manchester’s gaming community, full stop. So there’s that too! 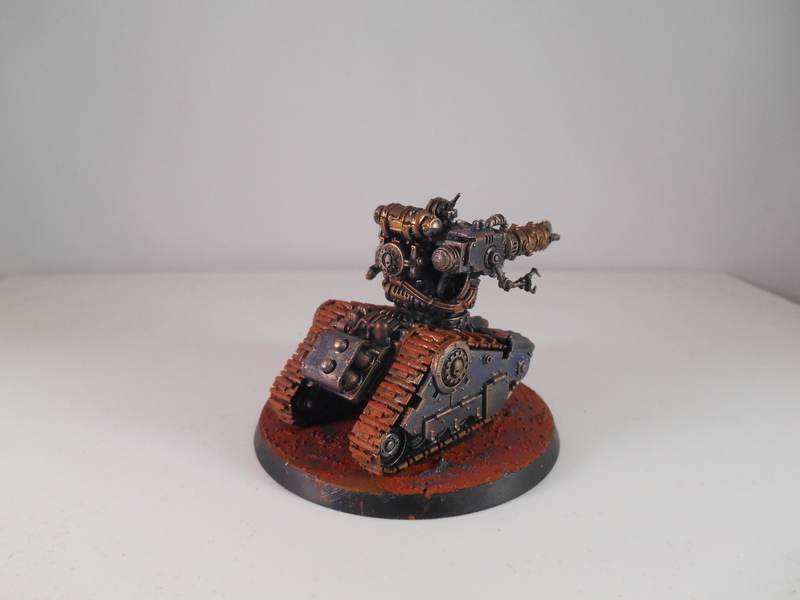 For bonus points, my house-mate has been infected by the same madness as me and has also pledged to buy a warlord. So we’ll be sharing resources and tools. as well as experiences in the process. After news got around at my local store, I’ve already received a preemptive Challenge from store staff for a 10k point battle in which both warlords face down an entire armoured company of Guard. 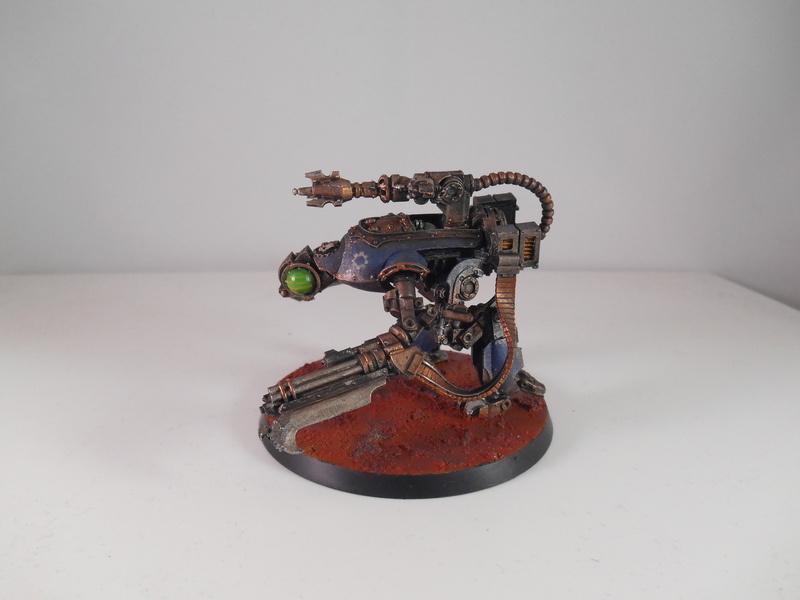 This entry was posted in Mechanicum, Warhammer and tagged 40k, Admech, Conversion, Forgeworld, Heresy, Imperium, Mechanicum, Princeps, Skitarii, Titan, Warlord on May 20, 2015 by ruadhan2300. 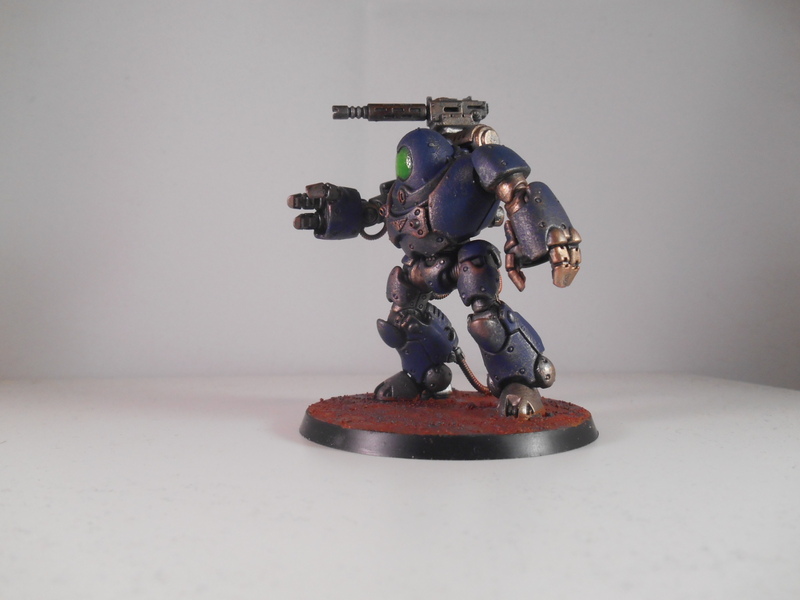 News from the Front: The Reaver Titan Meliora Bellator has been deployed to smite the enemies of mankind. 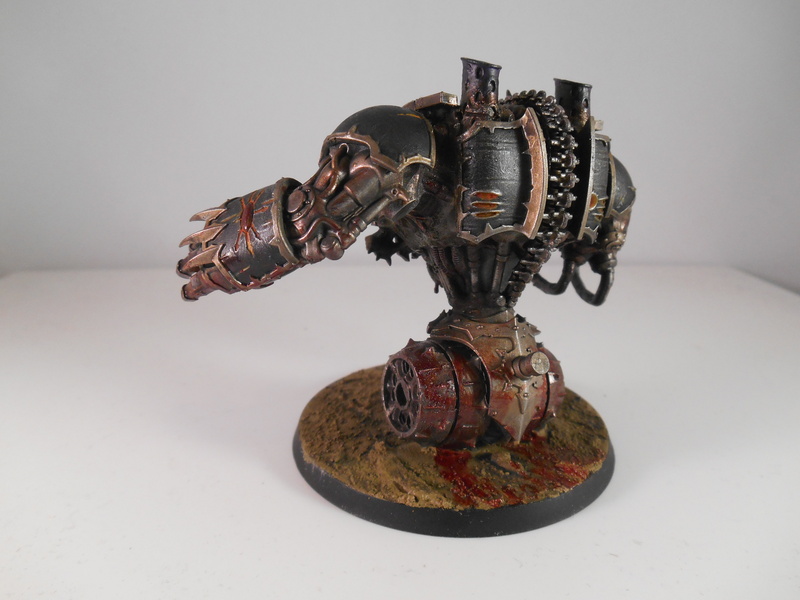 Yes, the titan is done. about £700 in costs and a modicum of blood and sweat, no Tears, I did get frustrated at various points but nothing worthy of crying over. 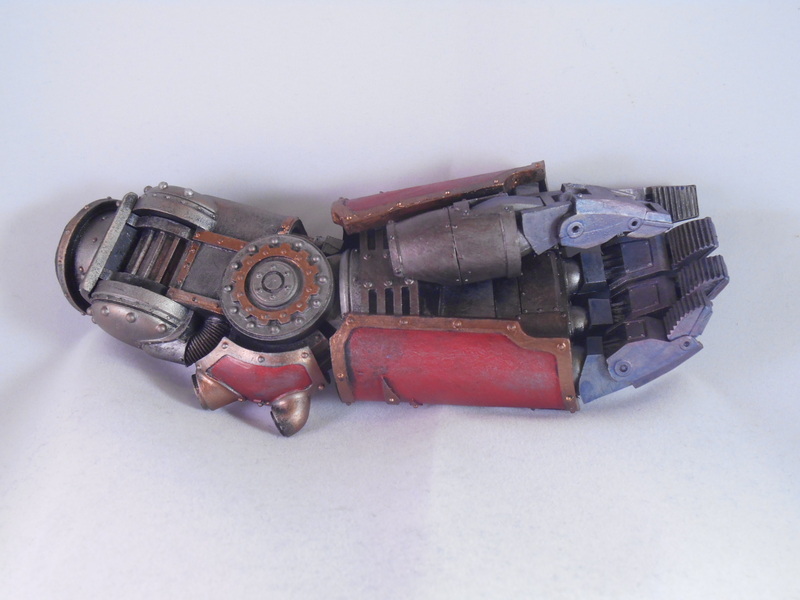 This won’t quite be the end of this project, I’m planning to extend the armaments of the Titan to include some of the other Arm Weapons and possibly some Carapace weapon conversions. 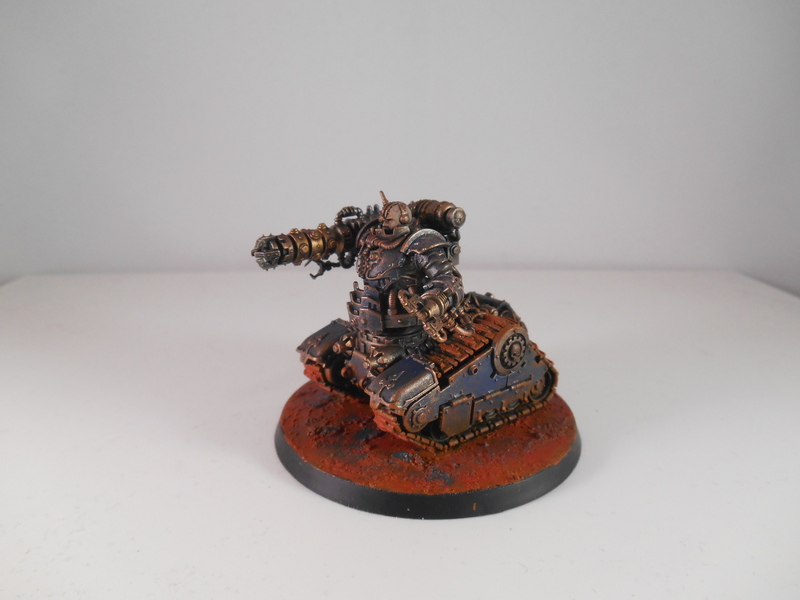 The prospect of giving it an Inferno Cannon pleases me possibly a bit too much. 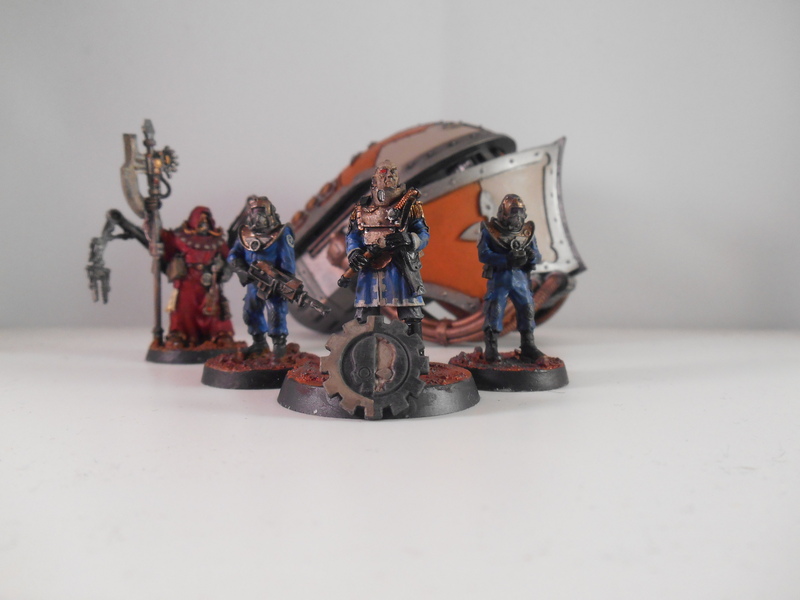 This entry was posted in Mechanicum, Reaver, Titan, Warhammer and tagged Big-Spenda, Complete, Heresy, Horus Heresy, Reaver, Titan on January 11, 2015 by ruadhan2300. I’d been putting it off with the vague plan to carve up the joints and build plasticard versions that I could make poseable. The kit is poseable in whatever pose you like, however with the caveat that once you decide on one, you have to glue it in place. 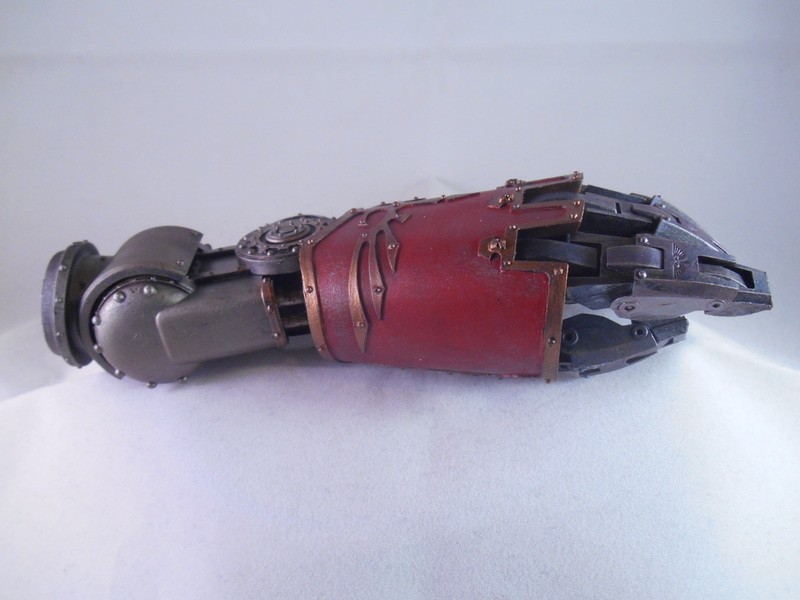 As a test, I drilled out and pinned each of the thumb joints, that worked great, but the fingers have armour plates covering each knuckle which simply cannot be made flexible. the only way I could think to do it was to put a dollop of hotglue underneath each one and let it flex and bend that way…I wasn’t convinced it’d work or stay intact after lots of playing. The second big problem was that all the major joints were basically a resin drum which butted up against a curved section of the next part. No-where to fit a pin for the joint. To that end, I bought some sheet plasticard to cut up in several layers and build into actual working replacement joints. Problem is a lack of appropriate tools to do that, I may yet in future though. In the end, I gave up and went with Generic Pose #1, the slightly camp not quite hand-on-hips that the official FW photographs of it use. 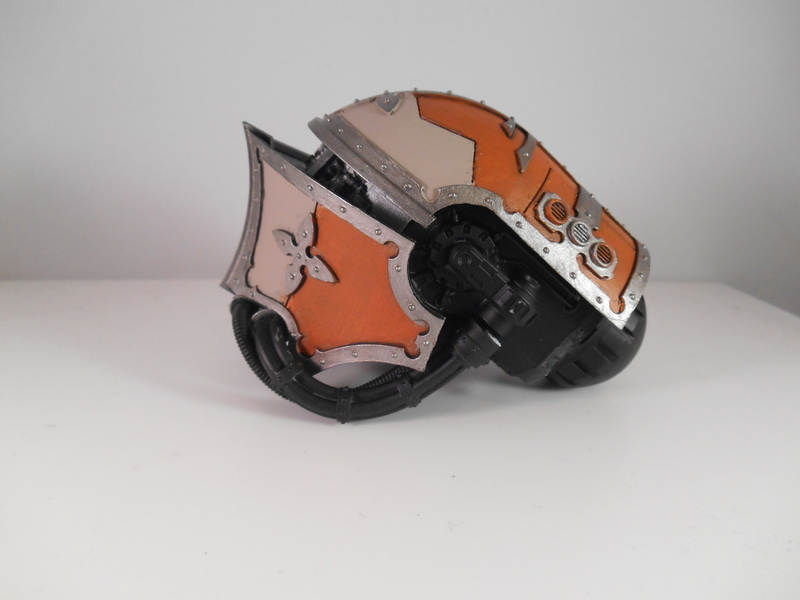 My Reaver is very nearly there. Drill Through feet to add Pegs to hold it to the base. Drill out shoulders so I can attach the arms by Bolts to the shoulders. 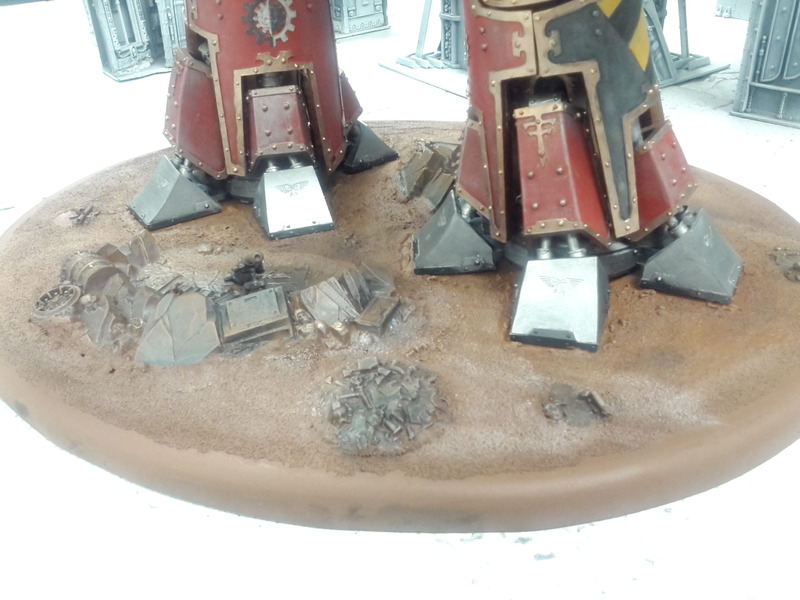 Scenic basing on the Base. assemble legs, the ankles and hip joints need gluing at this point. Assemble Waist section, not gluing the waist to the torso, it can sit stably on top of it anyway. 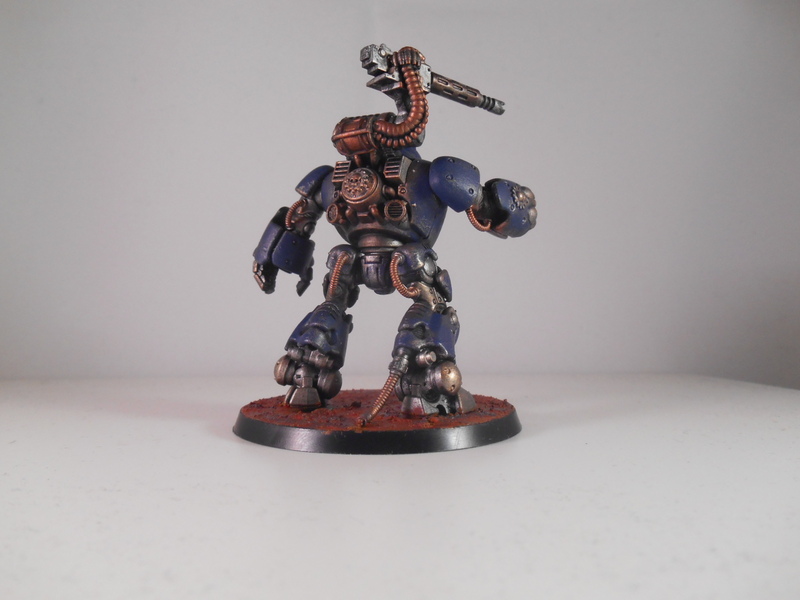 Magnetise elbow area for weapon arm so it can swivel. Acquire and attach corrugated rubber hoses, the resin ones are awkward. 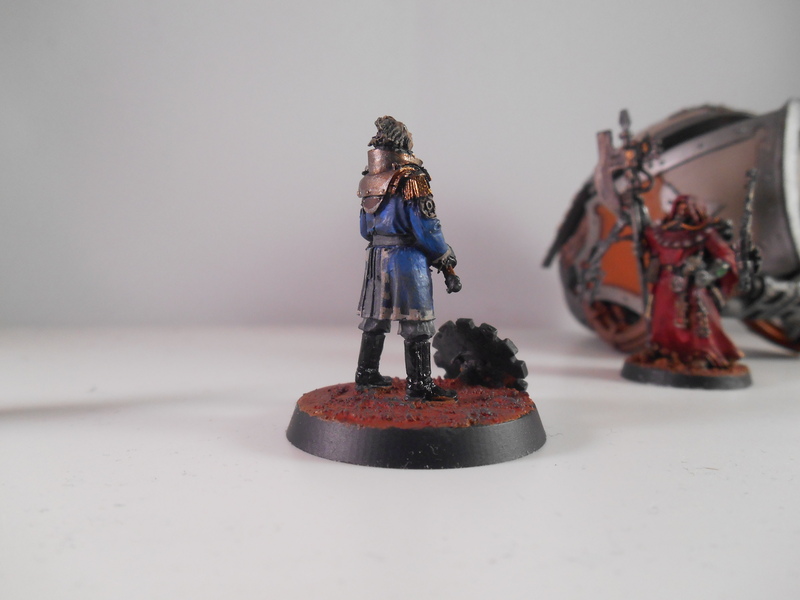 Estimated timescales…Most of the assembly and painting can be done in a couple days, the scenic basing will take a few days. I hope to have it very nearly done before christmas. 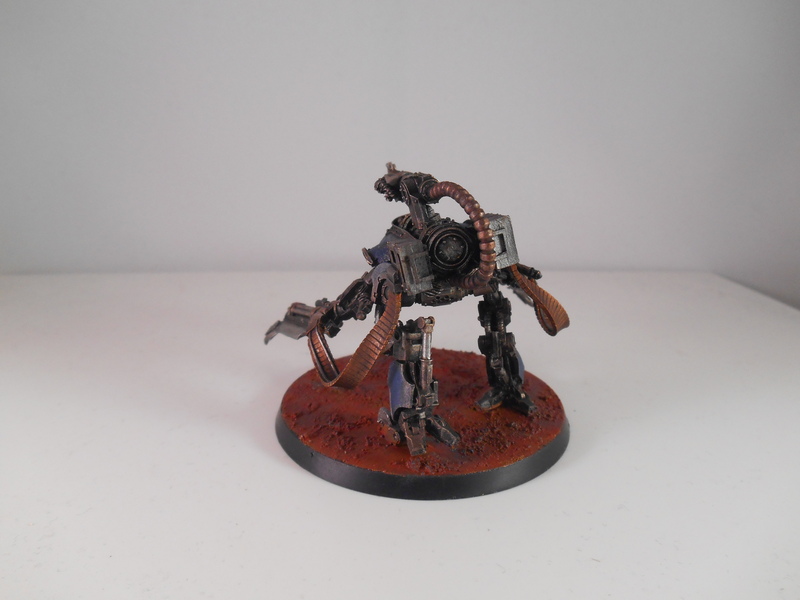 This entry was posted in Mechanicum, Reaver, Warhammer and tagged Big-Spenda, Mechanicum, Reaver, Titan, Warhammer on December 13, 2014 by ruadhan2300.